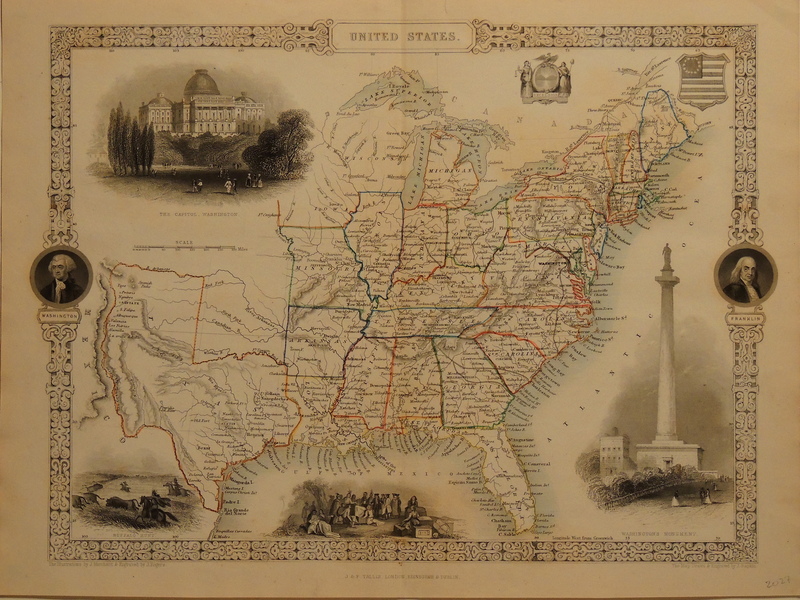 A highly detailed view of the country just prior to the Civil War. The western territories have interesting shapes. Texas extends northward to the Arkansas River and includes Santa Fe and Taos. Iowa and Wisconsin have undefined borders in Indian territory which is unnamed. The border of the map includes portraits of Washington and Franklin. Inside the border are vignettes of the Capitol, the Washington Monument, including a planned statue of him that never was completed, Penn’s treaty with the Indians and a buffalo hunt. Last, but not least the U.S. and Excelsior shields are in the upper right corner.